Vitamins and minerals are needed by our body in small amounts to function properly. While all vitamins are important as each one has a specific function, Vitamin C is one that takes the top spot in relation to skincare. Vitamin C not only helps to build your immune system but also is an great antioxidant that boosts healthy collagen production and helps restore your skin's natural moisture levels. Some research articles also say that it may assist in the reduction of fine lines and wrinkles. There are many modes of getting your required quota of Vitamin C - through food (fruits and vegetables), tablets, powder form (as in drink mixes), chewy pastilles and crystalline form. One recent form of Vitamin C supplement makes use of a natural Liposomal Encapsulated Delivery system to enable efficient transportation and absorption of the vitamin. 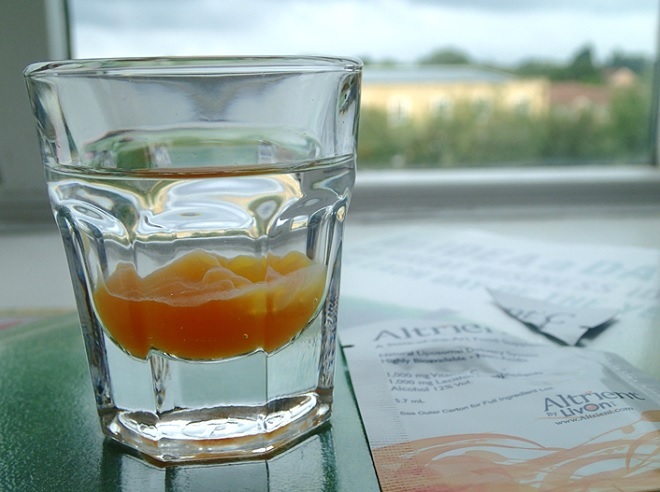 According to Altrient, who make these high-performance nutritional supplements, Liposome Encapsulated Delivery (LED) is their proprietary dosing system that makes use of microscopic bubbles called liposomes to surround and protect the nutrient formulas from our bodies digestive juices and transporting it directly into the bloodstream for efficient absorption. Altrient C by Livon is a 1,000mg Vitamin C supplement that comes packaged in a sachet form. The contents of the sachet have to be squeezed into around 60ml of water or juice and drank on an empty stomach at least 15 minutes before a meal. Because the vitamin is encapsulated in liposomes made from essential phospholipids, it will not dissolve. So, you will have a gel kind of bright orange liquid sitting at the bottom of the container. Mr.H who has trialled Altrient C, was initially not very keen on the texture and mode of consumption of the supplement. This could be down to the fact that the first couple of times he had it with fruit juice. Then he started consuming it in a shot glass with very little water. And just like a shot, you need to consume it real quick. The past month, when Mr.H has been on Altrient C, he has had zero instances of cold or flu. But the main difference has been in his skin's elasticity. His skin feels more firm and even to touch as though it has been uniformly hydrated from the inside. Based on his experience he rates this product well; both in terms of the immune support it offers and also the skin benefits. One suggestion that he offers is to consume this supplement in the mornings as it tends to give an energy boost. Having it late in the evening means your body and mind will stay active making it difficult to fall asleep. The taste and texture may take a little while to get used to, but once you are comfortable having it like a shot, even that issue is sorted. A box of Altrient C with 30 sachets costs around £29.95, making it expensive than other forms of Vitamin C supplements. But then according to the makers, it is the most bio-available oral form of Vitamin C available currently. It is a high strength supplement and gets absorbed optimally in the body. Note: As with the case of any type of supplement, please do consult your GP before you start taking any new vitamins or minerals. The review and opinions expressed in this post are based on my husband's experience and your experience may be different. Keep supplements and medicines away from the reach of children and always read the dosage instructions.